You are currently browsing the tag archive for the ‘Asian’ tag. Re-blogging because I’ve just sold another of these cushions! 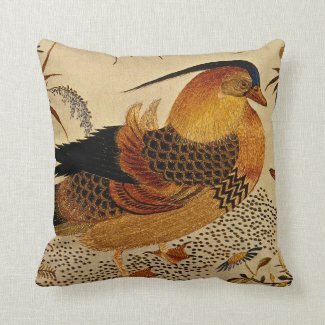 I was chuffed to sell this Mandarin Duck Throw Pillow over Christmas. It is a piece of ancient Asian art that I am particularly fond of. According to a quote from children’s writer Katherine Paterson on GoodReads (the only quote about mandarin ducks on the site! ), these birds “mate for life and will die of loneliness if separated from their chosen mate”. Yes, I’m a sucker for evidence of loyalty.